With taper mounting respectively thread mounting impact resistant. 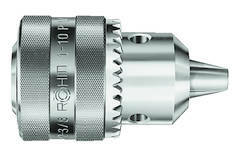 For drills with a high frequency we recommend key-type drill chuck Prima-Mat. With hexagonal take-up SW 6,3. Socket pressed onto the toothed ring and sunk, this connection is almost unbreakable.